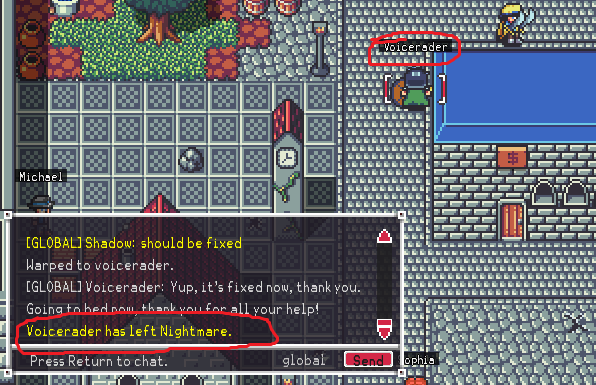 Is the screenshot from Voiceradars perspective, or yours? If his, does the message show before he logs out? Does the message show but he never logs out? Or does he logout and log back in and then see that message? Is he actually logged out but left in the game like a ghost? It looks like (you?) have him targetted... if he isn't targetted does it work properly? Without knowing these things trying to recreate and tackle this will take 5-10x longer. ﻿﻿﻿ Is he actually logged out but left in the ga﻿me like a ghost? I apologize for the lack of details. I was half asleep when posting the bug. It's from my perspective. He's logged out and in like a ghost. Whether targeted or not, it seems to happen. Also, this seems to be rather rare as I've never seen it before. @Xenogene: that helps, thanks. Any chance that he was in your party?